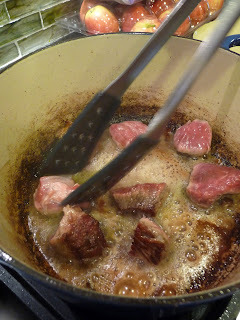 Braising is an indispensable technique for cooking economical cuts of meat. 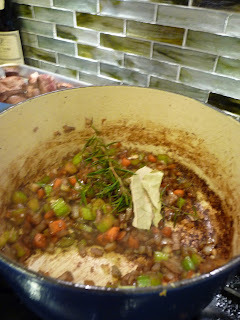 Braising is similar to stewing, in that you simmer it slowly in liquid. But first you brown the meat so it develops a nice layer of flavor, add aromatic vegetables, then add liquid so it’s about halfway to 3/4 of the way up the level of meat. 4. You can braise anything: Meat, poultry, vegetables, even fish. 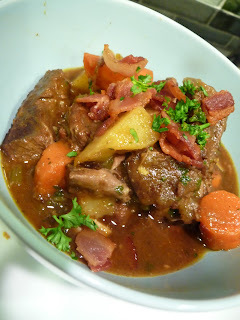 Everything you braise comes out tender, falling apart and full of flavor. 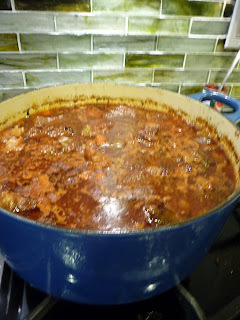 If you are wanting to braise meats, you want something with a lot of connective tissue (ie: cheaper cuts), because after all the slow cooking over low heat, that connective stuff will just melt away and leave you with falling-apart, fork-tender deliciousness. Today I’m demonstrating with some chuck roasts. 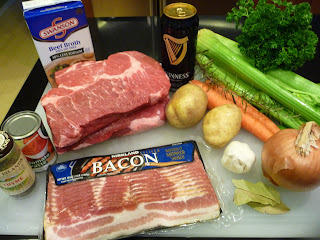 And we’re using beef stock and a can of Guinness for the braising liquid. Wine is also good. But I always use a combination of stock and some kind of booze. 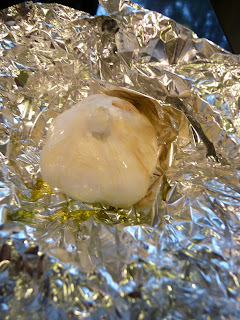 Just for the heck of it, I’m adding roasted garlic to our stew, so to roast the garlic, put it in a pocket of foil, put a little oil or wine on it, wrap it up then pop it into a 350* oven for about 30-40 minutes. It will be soft when it’s done. Just set it aside for later. Get your aromatics ready. Onion, celery, carrot and garlic. Trim off the large chunks of fat and the silver skin, if any is left on the roast. 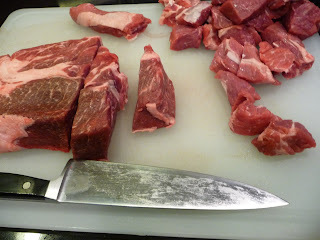 Then cut it into approximate 1″ chunks. Try to have the pieces in uniform size so that they cook evenly. 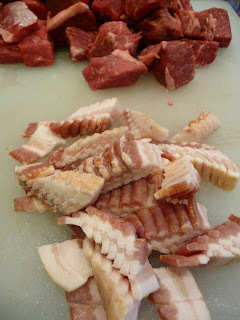 Cut some bacon into 1/2″ strips. I used 1/2 pound here. Brown the bacon in a Dutch oven. When the bacon is crispy, remove it and set it aside. Leave about 2 Tbsp. of the fat in the pan, reserving any bacon fat for later. Working in batches, brown the meat in the bacon fat over high heat. 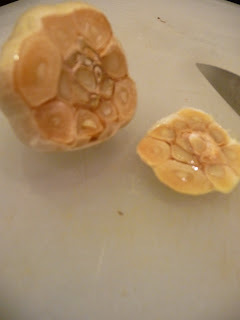 You want these chunks to get very brown on the outside but not cooked through. Do not crowd the meat! Some recipes will tell you to flour the meat, but I don’t like to do it that way. As it browns, set meat aside on a tray and start the next batch. 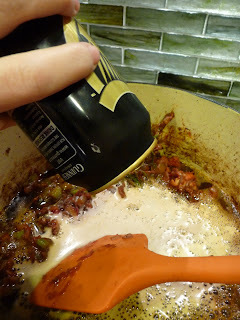 Use more of the reserved bacon fat if the pan gets dry. When all the meat is browned, add the onion, carrot and garlic and stir with a wooden spoon to remove all the brown stuff that’s stuck to the bottom of the pan. Season the vegetables with salt and pepper. 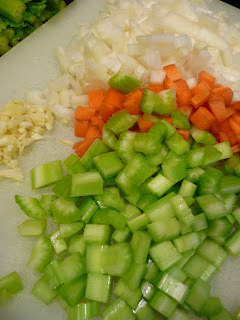 When the vegetables are soft, add the garlic. 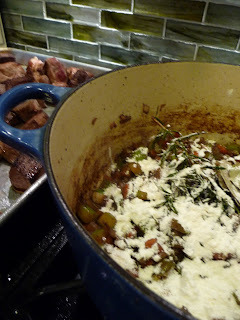 Add the herbs–I have a sprig of rosemary, a few bay leaves and I had to use dry thyme because in the state of Washington, they had no fresh thyme at the store. Use 2 sprigs fresh thyme if ya got it. Now is when I add the flour. I sprinkled about 3-4 Tbsp over the top of the vegetables. Then add tomato paste. I put in about 1/2 of a small can. This doesn’t make it taste tomato-ey at all, just gives it a nice flavor. Beer—though you could use wine (about 1/3 bottle) or just stock. Add back the meat, plus any accumulated juices that got left behind. Bring the pot to a simmer, lower the heat, then cover it. Let cook for about 1-1/2 hours on low heat. You may want to check it occasionally to make sure it’s not boiling. If it boils for long the meat will get tough. You want to make sure that it stays at a low heat. Uncover the pot and let it continue to simmer lightly. 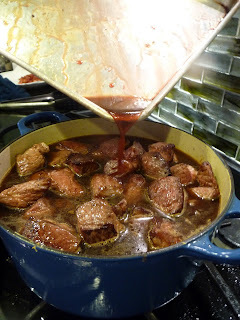 After about a half-hour, you can skim the fat off the top of the braising liquid. And take out the stems and bay leaves. When the meat is tender, but not falling apart, add the potatoes and the carrots. Stir through and let cook until the vegetables are tender. Oh yeah, remember the roasted garlic? Slice off the bottom. 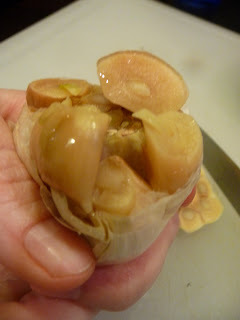 Then give the top a squeeze–the garlic bulbs will squish out the top. Put them into the stew and stir it about. 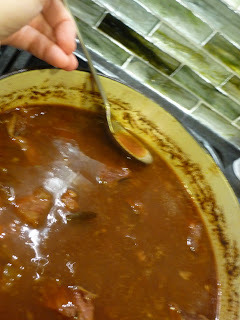 Taste the stew for seasoning and add salt and pepper as needed. When the vegetables and meat are fork-tender, ladle it into bowls and top with that reserved crispy bacon and a bit of parsley, if you like it. 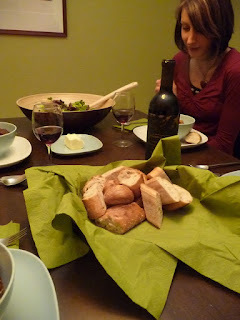 Some nice crispy bread is also required. And a bottle of wine is also usually required. 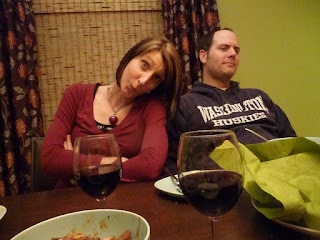 Danielle, do you think you can braise now? Mike looks skeptical, but I think you can do it. 4 lbs. Chuck roast or Cross-Rib Roast, trimmed and cut into uniform pieces, about 1"
Brown the bacon in a Dutch oven until crisp. 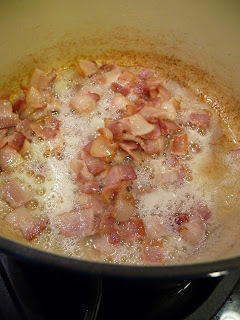 Set bacon aside, leaving about 2 Tbsp fat in the pan. Set aside remaining fat. Season the beef with salt. Working in batches, brown the meat in the bacon fat. Do not crowd the pan. When the meat is browned on all sides, set aside and begin another batch. Keep going until all the meat is browned, adding more fat as needed. Set aside. 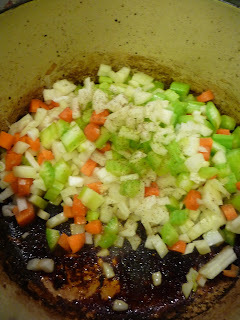 Add onion, carrot and celery to the pan, stirring to loosen all the browned bits that are stuck to the bottom of the pan. Season the vegetables with salt and pepper. When soft, add the garlic and cook for a minute. Add the herbs, then sprinkle with flour. Stir in and let the flour cook for a few minutes. 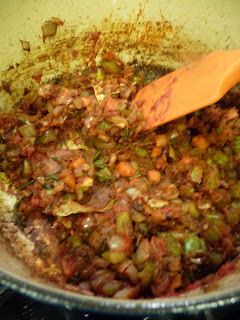 Add tomato paste and stir into the mixture. Add the beer or wine and the stock. 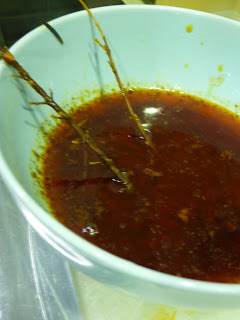 Stir until incorporated, then add back the meat and any accumulated juices. 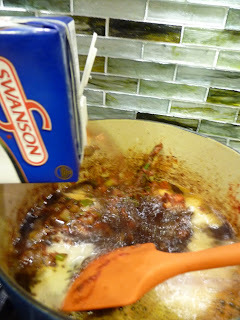 Bring to a simmer, then lower the heat and cover. Let cook for 1-1/2 hours, checking occasionally to make sure the heat does not get too high. Uncover the pan. Let continue to cook over low heat. 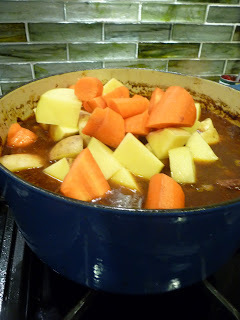 When meat is fork tender, add potatoes and carrots and roasted garlic, and let cook until vegetables are cooked through, approximately 30 minutes. Taste for seasoning. Adjust if necessary. 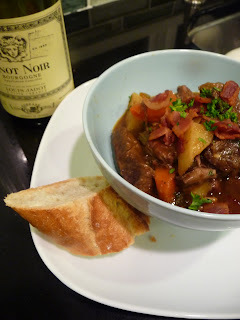 Ladle stew into bowls, garnish with parsely and reserved crispy bacon.